The animation of four images above shows Jupiter in infrared light as seen by NASA's InfraRed Telescope Facility, or IRTF, on May 16, 2015. The observations were obtained in support of NASA's Juno mission by a team headed by Juno scientist Glenn Orton. Observations like these are helping to provide spatial and temporal context for what the science instruments on board Juno will see once the spacecraft arrives at the giant planet in mid-2016. Juno will pass very close to the planet — coming within just a few thousand miles (or kilometers) of the cloud tops every two weeks. That up-close vantage point will be balanced by distant views of the planet that show how different features move and change over time in relation to each other. The IRTF is a three-meter telescope, optimized for infrared observations, and located at the summit of Mauna Kea, Hawaii. The observatory is operated and managed for NASA by the University of Hawaii Institute for Astronomy. 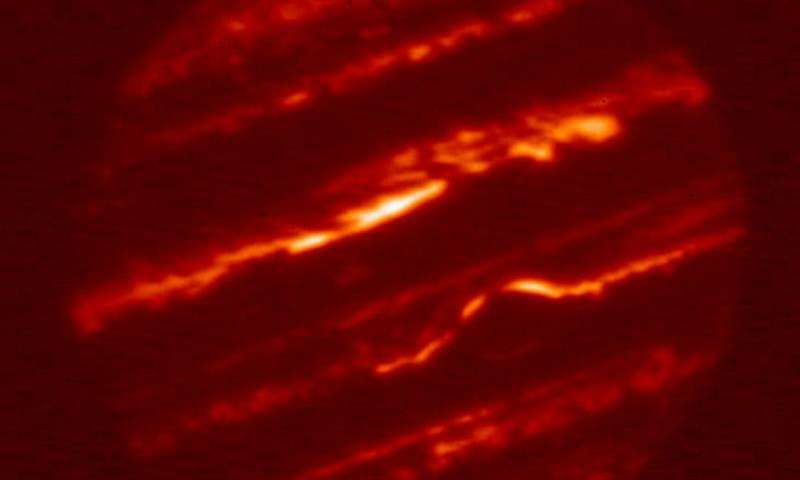 "We have models that tell us what to expect, but the fact is that Juno is going to be immersed in a strong and variable magnetic field and hazardous radiation, and it will get closer to the planet than any previous orbiting spacecraft," said Bolton. "Juno's experience could be different than what our models predict — that's part of what makes space exploration so exciting." The revised plan lengthens Juno's mission at Jupiter to 20 months instead of the original 15, and the spacecraft will now complete 32 orbits instead of 30. But the extra time doesn't represent bonus science for the mission — rather, it's an effect of the longer orbital period and the change in the way Juno builds its web around Jupiter. Basically, it will take Juno a bit longer to collect the full data set the mission is after, but it will get a low-resolution version of its final products earlier in the mission than originally planned. NASA also recently approved a change to the spacecraft's initial orbit after Jupiter arrival, called the capture orbit. The revised plan splits the originally planned, 107-day-long capture orbit into two. The new approach will provide the Juno team a sneak preview of their science activities, affording them an opportunity to test the spacecraft's science instruments during a close approach to Jupiter before beginning the actual science phase of the mission. The original scenario called for an engine burn to ease Juno into Jupiter orbit, followed by a second burn 107 days later, putting the spacecraft into an 11-day science orbit. In the updated mission design, the orbit-insertion burn is followed 53.5 days later by a practice run at Jupiter with science instruments turned on, followed by another 53.5-day orbit before the final engine burn that places Juno into its new, 14-day science orbit. With the countdown clock ticking — this time, not toward launch, but toward arrival at their destination — the Juno team is acutely aware of how quickly they're sneaking up on the giant planet. And their excitement is building. Five 'Buried' Supermassive Black Holes Detected –"Huge Number Exist Throughout Universe"
The Early Mars –"Warm High Seas, or a Cold, Icy Planet?"